Family history enthusiast Carl Tiedt stands in the doorway of his great-grandmother’s house in Burgen, Germany. Give us 11 months to prepare for a family history trip and you just never know what you are going to experience. How about stepping foot into the house where your great-grandmother lived as a little girl? What about wine tasting with cousins, who by the way, also make that wine? What about seeing a church that dates back to the 10th century? Meeting the last remaining member of your ancestral line in this part of the world? 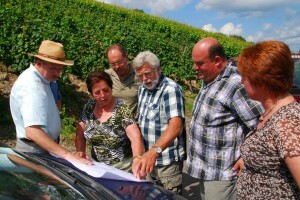 All of that, and more, were experiences enjoyed by Carl Tiedt and his wife Barbara during a whirlwind day, August 7, when we spent most of the day with his cousins and other family in and around the hamlet of Burgen, tucked away in a quiet valley just off the Mosel River of Germany. Professional researcher Roland Geiger, far left, shows members of Carl Tiedt’s extended family in Veldenz plots of land where their ancestors grew grapes more than 125 years ago. Planning started for Carl and Barbara’s trip in late August, 2013. 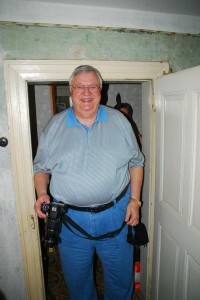 Soon after, Carl was put in touch with Roland Geiger, a professional genealogist based in St. Wendel, Saarland. Roland has been doing consulting work for European Focus Private Tours for more than a decade, with a super track record of success. Roland did not let anyone down this time, either. Not only did he find two ancestral houses, but he also located exact plots of land owned by Carl’s ancestors before they emigrated to America. 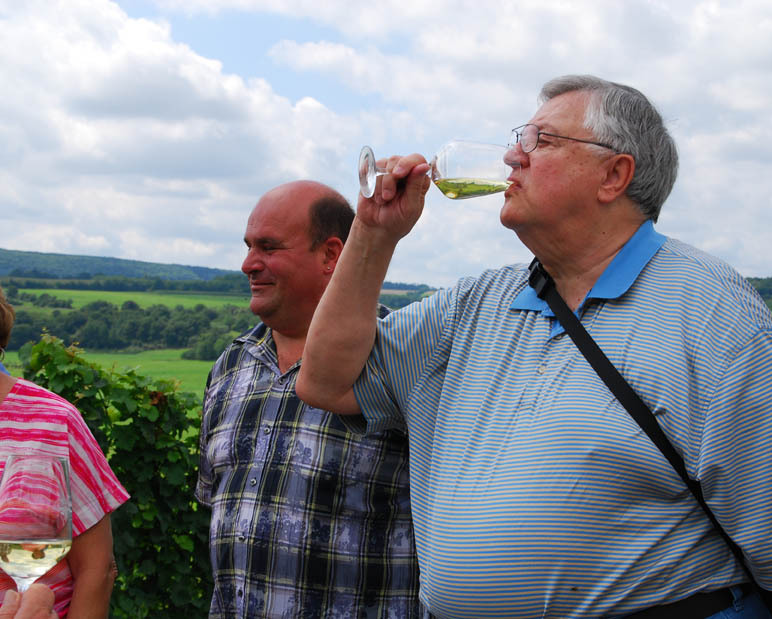 A highlight of the day was toasting those ancestors, and current cousins, with wine made by the Müller family on the edge of a vineyard once worked by Carl’s ancestors before their emigration in the 1880s. Martin Müller pours Barbara Tiedt a glass of wine and Carl drinks to his ancestors with cousin Jörg Müller, Martin’s father, at his side. The hamlet of Burgen has a population of 600. Many of them are involved in the production of wine. 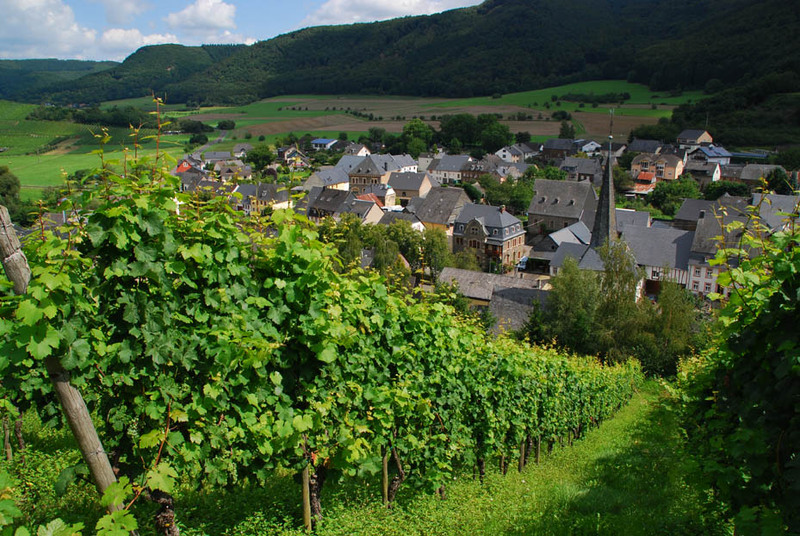 Posted in Family History Tours, Germany Tours and tagged family, genealogic, genealogy, germany, gorges, guided, history, mosel, müller, private, tour, tours, valley, veldenz, weingut.